The City of Wilmington needed to replace aging water and sewer pipes along North Third Street. At the same time, overhead utility lines, damaged sections of sidewalk and inadequate pedestrian crossings created an unattractive streetscape that discouraged pedestrian use. North Third Street is a high-traffic arterial for downtown commuters, with potential for a stronger economic base. 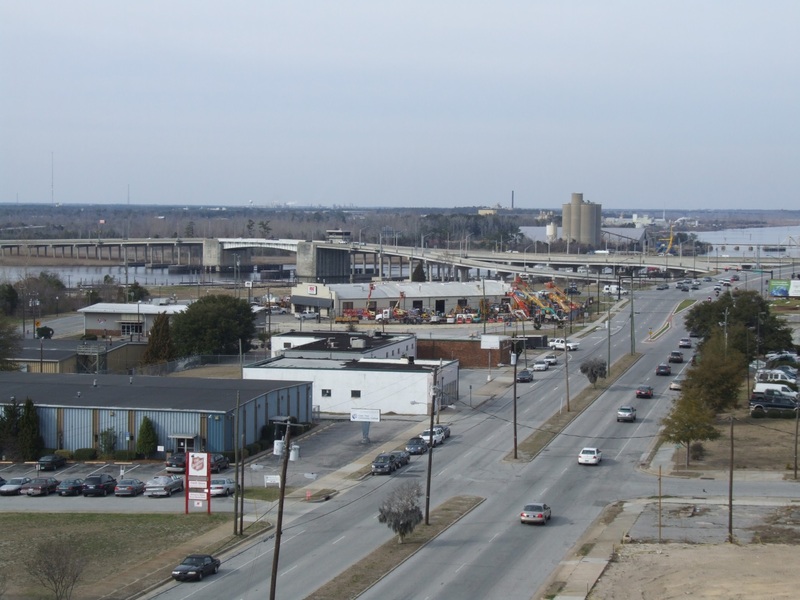 Local leaders hoped the improvements would encourage economic investment along the high-potential gateway to downtown Wilmington. 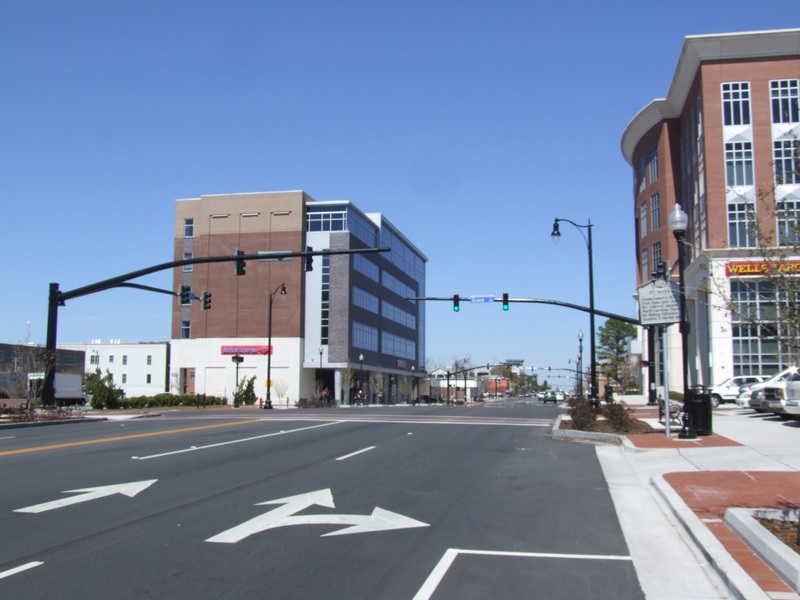 A joint project emerged between the City of Wilmington, Cape Fear Public Utility Authority and NCDOT after project leaders realized a downtown streetscape project on North Third Street overlapped with the necessary replacement of decades-old water and sewer mains. The streetscape improvements made North Third Street more attractive and pedestrian friendly, while the concurrent utility replacements ensured a shorter timeframe of disruption for businesses located downtown. North Third Street ranges from a 5-lane shared turn lane facility to a four-lane median-divided facility. It offers a mix of civic, institutional and commercial uses including Cape Fear Community College and the historic Thalian Hall Theater, prominent community features located within the City’s Historic District. North Third Street is also a gateway corridor for traffic exiting the Isabella Holmes Bridge from Martin Luther King, Jr. Parkway, which was completed in 2005 and serves as a first impression of the City for many visitors. Local leaders have used innovative strategies to improve the City’s Historic District, focusing on walking and biking as primary modes to experience the City’s community arts and regional tourist attractions. 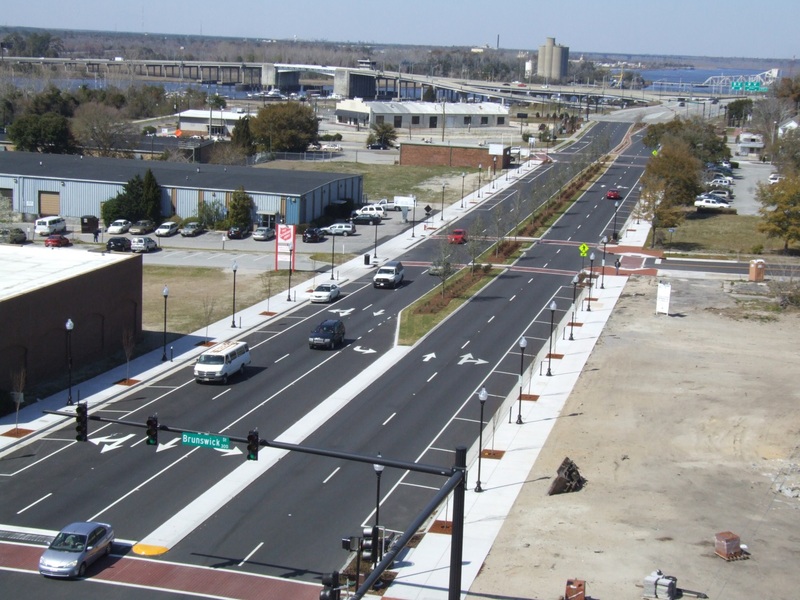 For years, the Wilmington Metropolitan Planning Organization increased community connectivity through bicycle and pedestrian projects like the 15-mile Cross-City Trail and the nearby River-Sea bikeway. However, much of this bicycle-friendly infrastructure has developed adjacent to Third Street, rather than on Third Street itself, doing little to reduce traffic and create walkability. As a result, Third Street remains a traffic collector, proving challenging for local businesses. The streetscape improvements begin at the new Martin Luther King, Jr. Parkway intersection and extend southward to Market Street (US 17-BUS). The project evolved from a simple traffic signal replacement to a full 12-block streetscape renovation, roadway resurfacing and underground utility replacement endeavor. 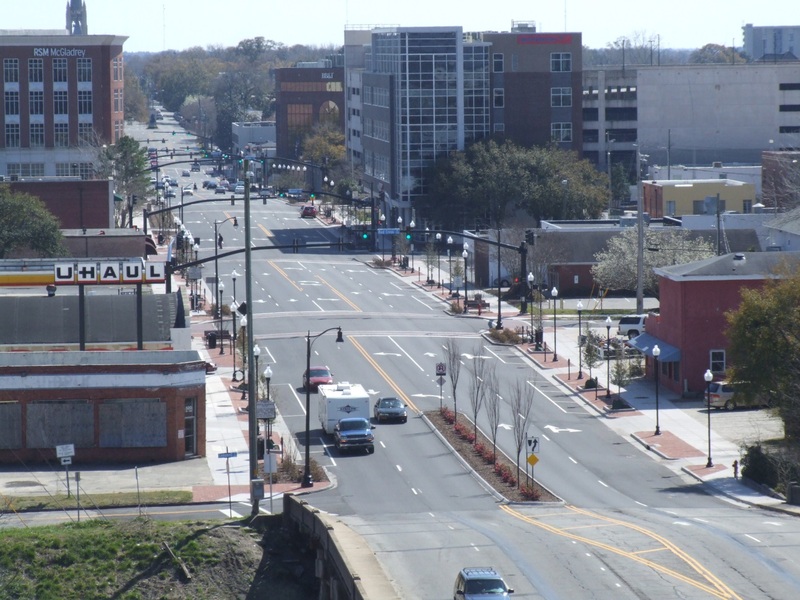 The Cape Fear Public Utility Authority’s (CFPUA) Capital Improvement Project list showed water and sewer line replacement as a priority, while the City’s Vision 2020 Plan underscored the project’s pedestrian connectivity elements within the historic downtown area. 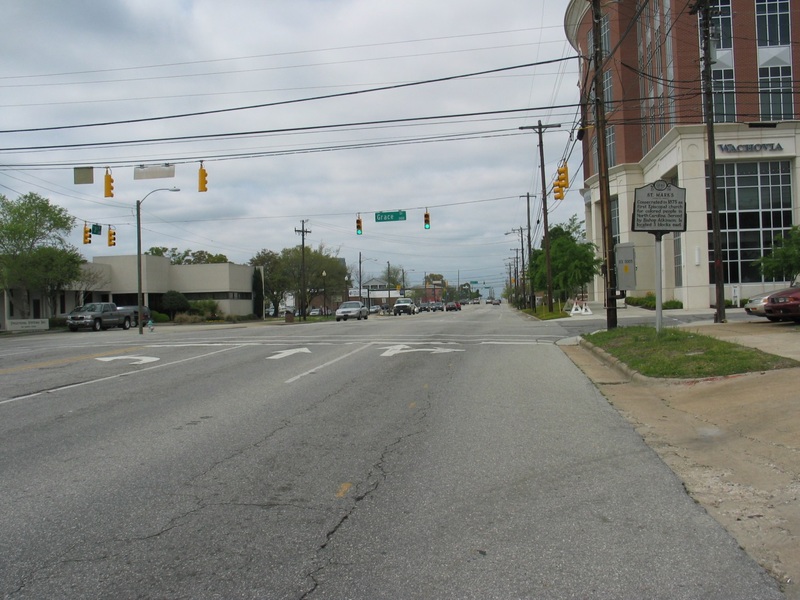 After the full scope of improvements was recognized, the City and Wilmington MPO partnered with NCDOT, and utility authority officials for the joint project. The coordinated effort was able to maximize project resources and funding while minimizing construction disruptions on downtown businesses and their patrons. The North Third Street project’s goals were to replace the aging water and sewer utility infrastructure while also resurfacing and renovating the streetscape to enhance the aesthetics of downtown. The project’s vision was part of a larger goal to create an inviting space for residents and visitors in the Historic District; one which would promote foot traffic while stimulating economic investment along the corridor. The multi-stage above- and below-ground renovations made interagency cooperation a top concern throughout the project. Local landowners were also needed to donate key pieces of land for the sidewalk expansion. If done properly, disruptions to pedestrian traffic during the construction phase would remain minimal and new crossing signals, medians and widened curbs would support cyclists navigating the downtown grid. City Project Manager Mike Naklicki oversaw the project’s construction, while CFPUA Project Manager Jamison Fair managed the water and sewer line replacements. The City coordinated with AT&T, Progress Energy and others for the burying of overhead utility lines while NCDOT funded the roadway resurfacing. “Every day brought a new surprise with this project,” admits Kozlosky, who recalled stories of work crews’ interesting findings among the aging sub-level infrastructure, such as a 50-year old underground storage bunker, as one of many factors that threatened to delay the project’s completion and affected residents’ access to the area. Motorists and bicyclists traveling through the area were encouraged to use alternate streets when possible. Despite concerns of delays, however, the $10.4 million North Third Street Project was underway in August 2011 and was completed by March 2013. Five million dollars ($5 million) in proceeds from a 2006 Transportation Bond Referendum funded the project’s streetscape renovation, with $1.9 million from the City, $1 million from NCDOT and $2.5 million in CFPUA funds going for resurfacing, utility replacement, and new sidewalks with street furniture and curb extensions at intersections. The North Third Street project increased connectivity for pedestrians within the Historic District by improving crossings at intersections, adding new sidewalks, attractive intersection paving, and landscaping on top of scheduled sub-surface utility maintenance. Not only was the City able to save money by combining the two efforts into one, they now have a Historic District that promotes walkability and makes Wilmington’s amenities easier to navigate for all transit modes. Kozlosky attributes the ability of multiple agencies to come together as central to the project’s success. “Interagency coordination was what made this project happen,” he says. 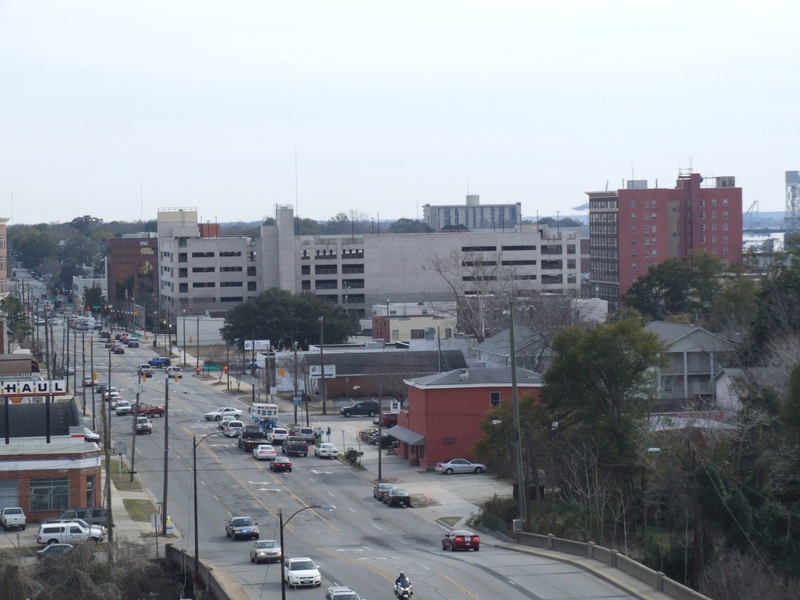 The next step towards improving the Third Street Corridor is NCDOT’s North Third Street Bridge replacement project in 2015. The new bridge will feature 8 ½ ft. wide sidewalks, bicyclist accommodations and incorporate North Third Street aesthetics into its design. The City of Wilmington has produced a short video on the completed Third Street project, which can be viewed on the City’s YouTube page. City of Wilmington. (2006). May 2 Transportation Bond Referendum. Kozlosky, M. (2014, August 29). Conversation about North Third Street Project. Naklicki, M. (2014, September 12). Personal communication. Spiers, J. (2014, September 3). Renderings visualize third street bridge replacement. Retrieved from: http://portcitydaily.com/2014/09/03/renderings-visualize-third-street-bridge-replacement/.